On October 31, 2019, Mario Draghi’s term as President of the ECB will come to an end. 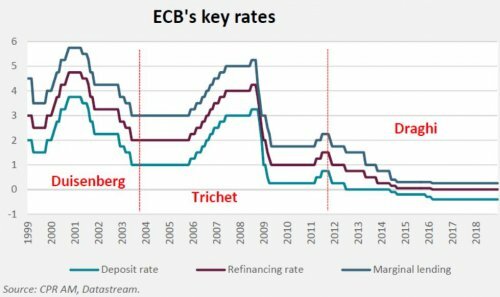 Even though Mario Draghi’s personality has had a profound impact on the way the ECB communicates and therefore acts, it is important to point out that it is a small team within the ECB Executive Board that has led the major changes in the monetary policy since 2011/2012 (first multi-year LTRO, 7 rate cuts, negative rates, Quantative Easing program). Among the architects of this policy are, of course, ECB President Mario Draghi, but also the vicepresident Vitor Constâncio, the chief economist Peter Praet and Benoit Coeuré. The mandates of these four members of the Executive Board took or will take an end between May 2018 and December 2019. Vitor Constâncio has already been replaced by the former Spanish Finance Minister Luis de Guindos. But the positions of Draghi, Praet and Coeuré will be filled by the end of the year, their terms ending respectively on October 31, May 31 and December 31. Recall the procedure for appointing the members of the Executive Board: the member states of the eurozone propose candidates for positions to be filled and then the Eurogroup (finance ministers of the eurozone) makes a choice. Once a candidate has been chosen, the European Council consults both the European Parliament and the Governing Council of the ECB before appointing it to the Executive Board. The appointment of members to the ECB Executive Board is therefore very political. Several balances are to be respected, in particular, the different nationalities present. 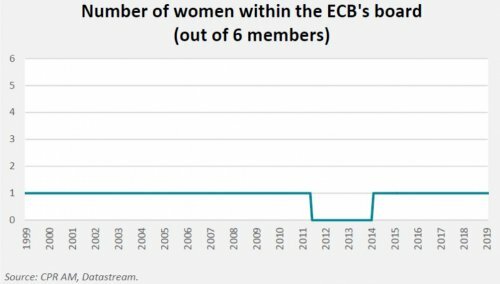 Since the creation of the ECB, the four major eurozone countries (Germany, France, Italy, Spain) have almost always had a member on the Executive Board. 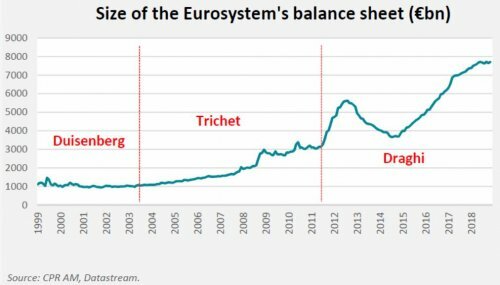 France did not have a representative from June 2002 to November 2003 but a tacit agreement wanted Wim Duisenberg to give up his position as President of the ECB at the mid-term in favor of Jean-Claude Trichet. Spain did not have a representative on the Board between June 2012 and June 2018, and it is interesting to note that the first appointment to the Executive Board since 2014 went to a Spaniard (Luis De Guindos). An implicit rule would therefore be that the four big countries are almost always represented. With the exception of November and December 2011, there have never been two nationals from the same country on the Executive Board (Lorenzo Bini Smaghi and Mario Draghi). After Draghi, Praet and Coeuré’s departure, the three remaining members will be Luxembourgish (Yves Mersch), German (Sabine Lautenschläger) and Spanish (Luis de Guindos), which in turn favors the appointment of a French national. The question of women’s representation on the Board also arises. Of the six members of the Directory, there has never been more than one woman. To make things worse, no woman has sat from June 2011 to February 2014. In addition, no woman has ever been President of the European Commission and since 1979, only two of the 15 presidents of the European Parliament have been women (Simone Veil and Nicole Fontaine). Then, surely, the question of skills arises. In this regard, Philip Lane, Governor of the Irish Central Bank since November 2015, has all the qualifications for the seat of Chief Economist. Lane is a worldrenowned macro-economist (he notably published in the prestigious American Economic Review), who has worked extensively on international capital flows (most of this work has been done with IMF economist Gian Maria Milesi-Ferretti). He therefore appears to be the ideal candidate to take over the post of Chief Economist Peter Praet. On top of that, another positive point for Lane, is that no Irish national has sat on the Directory thus far.Up until now, the three ECB presidents (Duisenberg, Trichet and Draghi) all had significant central banking experience. This was also the case for Vice-presidents Lucas Papademos and Vitor Constâncio, but not for Christian Noyer and Luis de Guindos, who had held different positions in the Ministries of the Economy and Finance of their respective countries, without ever having gone through central banks when they joined the Executive Board of the ECB. It would be surprising if the future president of the ECB had not already been a central banker. In addition to one’s resume, adherence to ECB policies and exceptional communication skills seem to be required for the presidency of the institution. As luck would have it, Mario Draghi’s term of office corresponded to a phase of easing the ECB’s policy and his successor term should follow suit - at least at the beginning - in tightening phase of monetary policy, which will be more complicated than usual, because of global economic and political uncertainties. The example of the Fed shows that the beginning of the cycle of rate rises after long years of unconventional monetary policy can be very difficult: the Fed had waited a long time before making its first rate increase in December 2015 and had to wait another year to raise it a second time. A perfect understanding of economic and financial mechanisms and a certain thoroughness will therefore be necessary. It is important that the future president of the ECB embodies this flexibility and is not overtaken by ideological issues.